Picture the scene – you have booked a cross-Atlantic trip to see one of your favourite sports teams in action. Excitement builds as the countdown to the flight continues. Elliot Hall (pictured left) and Brian Hardy were told the news live on TV. Now, imagine the disappointment when you realise you’ve flown to Toronto only for the cup draw to lead to them playing 450 miles away in Boston. 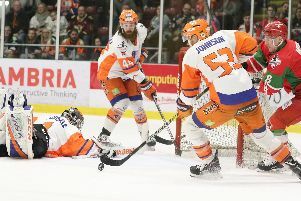 It wasn’t so bad for Sheffield Steelers supporters Brian Hardy and Elliot Hall though as they soaked up the atmosphere and watched Toronto Maple Leafs beat Boston Bruins on the big screen outside the team’s Scotiabank Arena. But then the trip got even better when former NHL star Brendan Shanahan, now president of the Maple Leafs, offered to fly them both to Boston, put them up for the night at the Boston Ritz Hotel as well as the lucrative tickets to game two of first round of the NHL Stanley Cup Playoffs at TD Garden. Shanahan has also paid a flight back to Toronto the following day on Sunday so they can finish off their trip.